I had my first play with the Brusho Crystal Colour the other day .... and I love them! After making this card, I was left with a strip of watercolour paper and a few puddles of coloured water on my mat. Naturally, I swished the strip of watercolour paper through the puddles but then decided that I wanted more impact so, while it was still wet, I sprinkled on some more of the crystals. I love the dramatic colour effect! 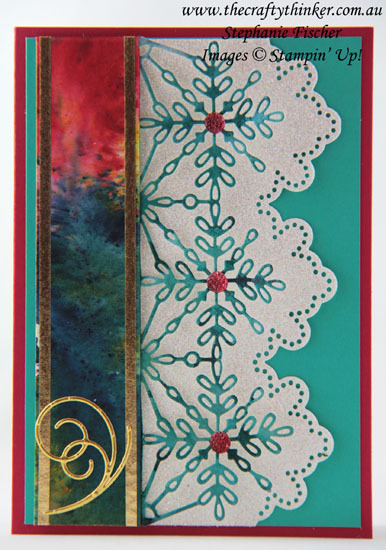 I then used some Dazzling Diamonds Glimmer paper, Bermuda Bay and Real Red cardstock to make this card - along with the gorgeous Swirly Snowflakes dies. 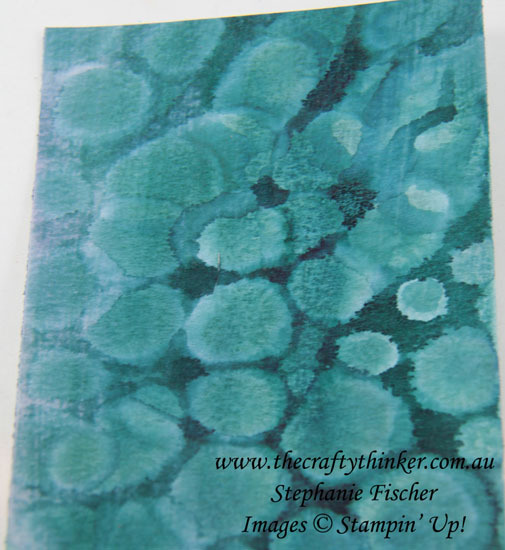 I coloured some Clear Faceted Gems with my Stampin' Blends alcohol markers. You may be wondering about the "splodgy" colouring on the snowflakes? Well, I finally used a failed experiment that's been sitting on my desk for quite a few months now! It was so long ago that I can't even remember the name of the technique but it involved painting several layers of white acrylic paint onto a piece of watercolour paper and then adding a layer of ink, allowing it to dry and then dripping on some alcohol before repeating the inking and dripping. My rather ugly background that I'd left discarded before I thought of die-cutting it! As a background paper it was a dismal failure - I thought it quite ugly - but I really like the effect now that it's been cut into snowflakes!